NOTE: I started writing this entry back in November 2011. Not sure why I didn't post it but I thought it was still interesting. The start of this post was referencing back to issues I was experiencing during the training for Rock'n'Roll Las Vegas Marathon. When I first started shopping for actual running shoes I went to a local running shoe store, Sports Medicine Store and Metro Walk & Run (very long name), that put you on a treadmill and videoed your feet. They then analyzed your step in slow-mo. Kinda cool but kinda nasty seeing your dirty socks flopping in slow-mo. Yes, I was expecting the person who helped me to look more of a "runner shape", but he did a great job if you ask me. So as you can see I went with the Mizuno Inspire Wave line of shoes to help correct my slight over pronation. Lime green - my first pair. Did my first half-marathon and a bulk of my marathon training. Orange (shocker) - I bought these off of amazon.com a few weeks before my first marathon but due to getting sick, I only wore them once before the marathon so didn't get a chance to break them in. They were still just fine. Blue - Went to my local bike shop's clearance sale and picked these bad puppies up. And by bad I mean they were the previous version (meaning slightly heavier) and the wrong size. Interestingly, I didn't realize I bought the wrong size until this past Thursday. Wore these during my first triathlon season (hence the Yankz laces) and first half-ironman. Silver - Purchased these at the Beach2Battleship expo. I was wearing my orange ones at the time, so that's what I used for size and Inspire #. So after Beach2Battelship I decided to retire the blue ones and started wearing the silver ones. I started immediately having issues with my feet. I'm sure some of it was because I was suddenly doing 15 mile runs on them :). But I got to the point where once I put them on my heel hurt. I'm not exaggerating here. In one step the pain would commence. When I noticed this I immediately put shoes #3 on and it didn't hurt. That's when I realized that something was up. I still haven't figured out that particular problem but I have been noticing some foot slippage on the new shoes that weren't in #3. So the smaller shoe is obviously a bit tigher, so I went back to them. I figured out I still have a good 150 miles to go on them anyway. So, not sure I have any lessons learned here but I think I'm going to stick with the size 11 shoes. I may go back to the silver ones after the marathon and start adding distance slowly on them. 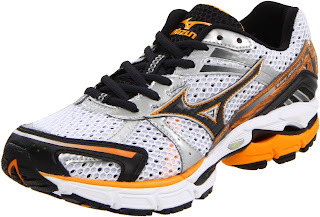 Update May 2012: I never went back to the silver Mizunos for running. While I do wear them around for running errands and such, they don't hurt when I put them on any more. I still won't chance running in them. What happened is when I visited the Rock'n'Roll Las Vegas Marathon Health Expo a few days after I started this post, I bought a pair of Mizuno Inspire 8 at the Mizuno booth. I completely skipped the "7" line of Inspire Waves as there were a lot of complaints about them on the interwebz. The 8s are awesome. No foot pain and they are orange again! I've logged roughly 300 miles on them. Getting close to consider ordering another pair. I had knee problems starting after I switched to the shoes I bought at the B2B expo as well. I am still wearing mine, however, so I think I will chalk it up to overtraining. I now have 213+ miles on them and things are going great. The ability to track the mileage on equipment is one of my favorite things about dailymile.com.